The Chicago Summer Service Trip has come to a close. As I work on sending out post-trip surveys, sorting through supplies and uploading pictures, I can’t believe how fast it went. Since starting my position as Elks Scholar Fellow at the beginning of April, my mind has been focused on all things Chicago, service and scholars. During my first few weeks, I excitedly labeled a large binder with a bright yellow sticky note titled Chicago Summer Service Trip, unsure of what I should put inside, but certain I wanted to be prepared. Over the course of the next few months, I had the opportunity to take ideas, suggestions and research and turn them into spreadsheets, emails and agendas. Due to eager service sites, the supportive ENF staff, a welcoming Elks Lodge and scholars committed to serving others, the concept of a trip in the City of Chicago became a reality. Although the planning was exciting and rewarding, the most gratifying part of the lead-up to the trip was meeting the scholars in person on day one. They went from being names on a roster to individuals with unique perspectives and personalities. Their energy and enthusiasm, their desire to connect with each other and with community members, and their wise insights shared in reflection consistently amazed me. I learned a great deal from the scholars over the course of the week, but in particular, I gained at least one key lesson every day. Sunday—There is such a thing as too many cooks in the kitchen. Half of our group made breakfast for dinner on the first night, and it was a great way to kick off our week. However, with eight cooks in the kitchen, we ended up with too few pancakes and two tons of sliced bananas. We had a great time though, and in the end, we enjoyed some delicious banana pancakes. Monday—Never say never! I eagerly signed us up to partner with a non-profit making a mosaic on the side of an elementary school for our first day. I was excited about the idea of revitalizing Chicago neighborhoods by means of artwork; however, I chose to overlook the fact that none of us had artistic expertise. I regretted my naïve enthusiasm when we showed up and I saw the magnitude of the mosaic. Yet, thanks to a great volunteer coordinator and scholars committed to learning new things, as you can see, it all worked out! Wednesday—Hoodies are never a mistake. As I passed out the scholars’ welcome kits upon arrival, I joked that they wouldn’t need to touch the hoodie we provide for each trip, being that it was June. However, on our evening boat tour on Lake Michigan, a good portion of them were proudly representing the Elks in sweatshirts. As an Arizona girl, I’m learning that Chicago summers are another story. Thursday—Set-up offers perspective. We helped set-up for the Chicago Standdown, an event that brings together dozens of organizations to provide practical services to homeless veterans, such as medical exams and housing assistance. Although set-up consisted of more indirect service, such as mopping floors, unloading pallets, sorting clothes and matching socks, it was an integral part of the process. It put into perspective all of the work that goes into making direct service possible, and it made the interactions with the veterans the next day all the more meaningful. Friday-Elks family is for everyone! The Brookfield, Ill., Lodge No. 1510 graciously hosted us for dinner on our last night. Within minutes of walking through the door, Elks members engaged scholars in conversation all around the room. From hearing stories of inspirational Elks members to getting a grand tour of the Lodge, our Elks family welcomed us with smiles. It was quite a challenge to corral everyone back onto the bus at the end of the night, which is not a bad problem to have. All in all, it’s difficult to find language to summarize the week because service trips are so unique. In the scheme of regular routines, having the opportunity to dedicate an entire week to service is atypical. The fact that Elks scholars traveled from all over the U.S. to unite in a common effort of giving back to others is refreshing. 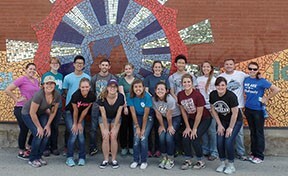 These service trips don’t happen every day, but with the Elks family, they do happen three times a year and communities and scholars are mutually benefitted through the experience. So as I place the Chicago binder on the shelf, I am extremely grateful that this was trip one of six in my term as the Fellow. I look forward to the trips ahead, and to learning more valuable lessons while serving alongside such inspirational scholars.